Looks very clean, the battery connection and storage looks clean too. Based on how it looks and not knowing if the unit works or not I believe I have priced it fairly, however I am open to offers. “The WS-1 comes with original box and manual. Items you are bidding on. You are looking at the legendary electronic rhythm machine of the late 70s & 80s; The Roland CR-78. The CR-78 was one of the favorite instruments of pop and electronic musicians in the late 1970s and early 1980s. Famous songs that make prominent use of the Roland CR-78 include “Vienna” by Ultravox “Heart of Glass” by Blondie and “In the Air Tonight” by Phil Collins. “Roland CompuRhythm Cr-78 vintage Rhythm Machine. Works great!! Got that “I can feel it coming in the air tonite” (Phil Collins) and “I can’t go for that” (Hall and Oats) sound, plus many more 70s and 80s hits. Very rare and collectible. Black Vinyl finish in good condition with a few minor surface scratches.” Auction ended. Click here to browse on eBay. 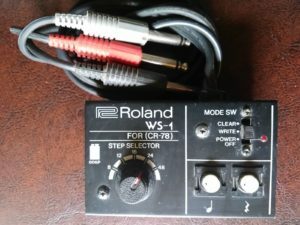 You are bidding on a Roland WS-1 Write Switch, an ultra-rare accessory for the CR-78 vintage analog drum machine, which allows you to step-write your own patterns. As you can see from the photos, it is in very good cosmetic condition: clean appearance, and all buttons, knob, cables and switch are present and in tact. Functionally, it works 100%. I had previously listed this unit about a year ago, and at the time it wasn’t working properly, but has since been serviced and is now working, as seen in this YouTube video, which is of the actual WS-1 on auction here. I have a PDF of the owner’s manual as well as very rudimentary schematic for it, which I can either email to you, or print and send to the winning bidder. Regarding the photos – the WS-1 is pictured with a Roland CR-78. Please note that the CR-78 is not included with this auction.” Auction ended. Click here to browse on eBay. Functionally, it works, but there is a problem: the rest button is problematic. It only works intermittently, approx 1 out of every 10 times that you hit it. I would imagine that this is probably due to something minor like a loose solder connection, but I can’t say for sure what it is. I did open the WS-1 to see if I could see anything obvious like that, and nothing stood out, but please note that I am not a techy person at all! I do have a PDF of the owner’s manual as well as very rudimentary schematic for it, which I can either email to you, or print and send to the winning bidder.